This is a lighter take on barbecue, sweet mustard-based. 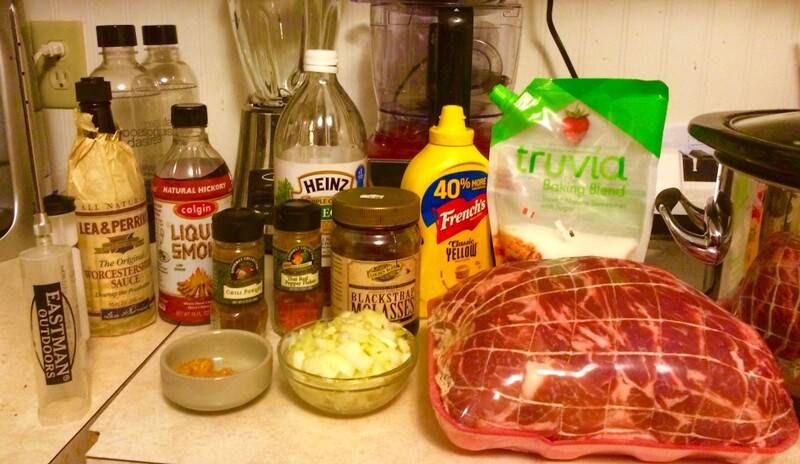 It’s also done in a slow cooker to make things easier, which is the reason for the use of liquid smoke. The Splenda or Stevia is to make the sauce lower calorie and lower carb. Put the onions in the bottom off the slow cooker. Season the roast with some salt and pepper to taste. Put the slow cooker on low and cook for 7 hours or so. In a sauce pot, put in the yellow mustard on medium heat (use a sauce pot with room enough to add more ingredients). Once the mustard is heated up, turn the heat to low or simmer. Add in the vinegar, liquid smoke, molasses, Splenda or stevia, tomato paste or ketchup, Worcestershire sauce, chili powder, and cayenne pepper (if using). Return the sauce to a simmer. Now it’s a tasting game. I take the sauce pot spoon and drip some sauce out into my tasting spoon (or else I run through all of my spoons pretty quickly). Add Splenda, mustard, molasses, or vinegar to adjust the taste until you think it works. Using tongs or a rubber glove (or whatever you come up with), pull the bone out of the roast. It should come easily. Take the shredder claws (or two forks) and shred the pork completely. Make sure to skim or crape off the fat layer (usually on the bottom of the roast) and discard it. Once shredded, take half of the BBQ sauce or so and mix it in with the pork. Use more if you’d like, but make sure that there’s a bit of sauce left over to put in a side dish for folks.